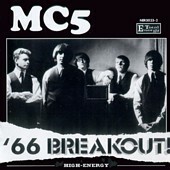 In Music We Trust - MC5: '66 Breakout! One of the most political rock 'n' roll/punk bands in history, Detroit's MC5 are a piece of history that should not soon be forgotten. Their approach to music, ideas, and life were remarkable. They spoke their minds and didn't care who they pissed off. They are the epitome of what punk rock was all about: bold music that took a stance and had something to say. Let's just say, without MC5, the punk rock movement may never have taken shape. Within the spirit of rock 'n' roll, Alive/Total Energy Records is releasing early live recordings and demos compiled by Wayne Kramer, celebrating the influence and power that was MC5. Before they found their voice, or took their political stance, these five young Motor City kids were just rocking out and having a blast. Chronicling the first year of the band, '66 Breakout! features songs recorded between '65-'66. "I'm Writing this today and listening and I'm 50 years old now. It was thirty-five years ago! it boggles my mind, but the sounds on here are timeless. Diamonds are forever. These are uncut gems," writes Wayne Kramer in the closing of the linear notes found within this CD. And, honestly, I couldn't have said it better myself. Though these tracks showcase a young, undeveloped band just waiting to breakout and display their talents to the world, there is tremendous value in them. First off, the fact that they are early recordings of a band that took the musical world by storm instantly gives them value. And, second, they are MC5 recordings before MC5 was the MC5 we know and love. "Looking At You" and "Black to Comm," two songs recorded at Cody High School, are clean cut 60's rock 'n' roll with tremendous energy and vitality running through them. Sweet, danceable, and filled with fun, this is what rock 'n' roll is all about. Of course, the rest of the disc is exactly like these two songs. "I Don't Mind" is a slow-dance ballad while "One of the Guys" is a balls-y rocker with sweet guitar licks, a dynamic rhythm section, and melody galore. Other cuts like "Baby Please Don't Go" and "I Can Only Give You Everything" showcase the love, youthful-ness, and stellar talents this band possessed. Here is a rock 'n' roll treasure. Not only will the MC5 fanatic cherish this album, but anyone who likes straight-from-the-heart, fun rock 'n' roll will fall head over feet for this album. From love songs to some of the most political tunes you'll ever hear, MC5 could do it all. Here is testament to that fact. I'll give it an A+.